Can we bring the advantages of an elementary school strategy for building a classroom community to the higher grades? Morning meetings are a nearly ubiquitous feature in elementary classrooms. Students gather on a rug to discuss the calendar, the weather, the news, and how they’re feeling as the day begins. It’s a wonderful system for building community and trust and for setting the stage for a day full of learning. But can that work when you’re a teacher who starts the day three, four, seven, or eight times? Middle and high school students need classrooms that hinge on community and trust just as much as elementary students do—can we replicate the outcomes of the morning meeting in a way that makes sense developmentally and logistically in higher grades? How do morning meetings help classroom communities develop? When students first gather at the beginning of the year, the most immediate need is gathering knowledge—new names, news from the summer, and current interests, as well as who you are as a teacher and what the class is going to be like. Students are also figuring out whether they’re going to be with people who like them and whom they like. Morning meetings help create an environment of increasing trust in a classroom. As students become more aware of who is in the room, they need to learn how to communicate with one another. What are the expected norms and processes for discussion? Next they learn how to cooperate, like how to not get in one another’s way as they work toward a common goal. As they gain skill in cooperation, they cross over into collaboration—a shared investment in the success of all members of the community. At each of these stages, they face conflict and successes and build the trust necessary to move to the next level. In upper grades, what should we do to focus our opening instructional moves on the deliberate creation and maintenance of a learning community, without sacrificing valuable instructional time? First, we have to recognize that we’ll get more out of our students if they feel safe, supported, and known well in our classrooms. The time spent building community will come back to us exponentially in fewer behavior issues and better student engagement. Knowledge: Use names. Make sure you know your students’ names and that they know one another’s names. I’m always amazed to find that kids who have sat side by side for years don’t know one another’s names. Require them to use names in responding to one another. Ask students to respond to an opening prompt with a piece of information about themselves, some news or insight that they can share with a partner. Keep the stakes low here (favorite band, worst movie ever, plan for surviving the zombie apocalypse, etc.). Be sure that you respond to the prompt as well—let students get to know you. Build a classroom culture filled with rituals and traditions that make your class different from others, like greeting students with a handshake at the door, putting a silly question on the board at the start of class, or keeping a silly piece of classroom decor—I was partial to a plaster rooster and an upside-down Christmas tree. Be sure students know you like them. And create space for them to know one another through (appropriate) humor. Communication: Take the time to articulate what you mean by a quality discussion (or better yet, arrive at a description as a class). Build a T chart with specific expectations about what it looks and sounds like when people are communicating effectively, and use that chart to assess the quality of the communication processes as students move through review material in the earliest days of the class. Offer feedback about what you see and hear. You could also get students’ feedback—consider recording the class at work and then showing the recording to students so they can look for good examples of quality communication processes. 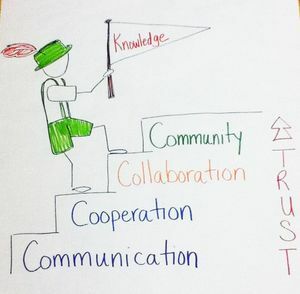 Cooperation: You can build and reinforce cooperation skills with traditional community builders, or do so through academic work—whatever makes the most sense to you. In either case, be sure to articulate what quality cooperation looks and sounds like, and then ask students to demonstrate it. Take the time to reflect together on the process and results. Collaboration: When the class is at a collaborative stage, your job becomes maintenance. Use Google Class to take a quick survey at the start of class, focusing on a topic of the day—this can be a serious topic, but it doesn’t have to be. Ask students to give feedback on their homework, to talk about how they approached a project, or to comment on the outcome of the big game the night before. But what about when conflicts arise? Just remember: Kids want to be safe, just like we want to be safe. They want to be known and liked. They know they’ve been let down before—by their teachers and by their peers. Their peers will have to earn their trust, and teachers need to facilitate that. That means setting clear expectations about classroom behavior, including responding to put-downs and unkind words. Such words are harbingers of the next level in the group’s development. See them as such—lean into conflicts and refuse to let kids off the hook. If you stand your ground, insist on the behavior you want to see, and keep your sense of humor, you’ll get there.